FOFriday 7-6-18 — Knit'n Kitten Fiber Arts, Inc. This is a Noreen Crone-Findlay Friday since both projects were inspired by her videos on YouTube. 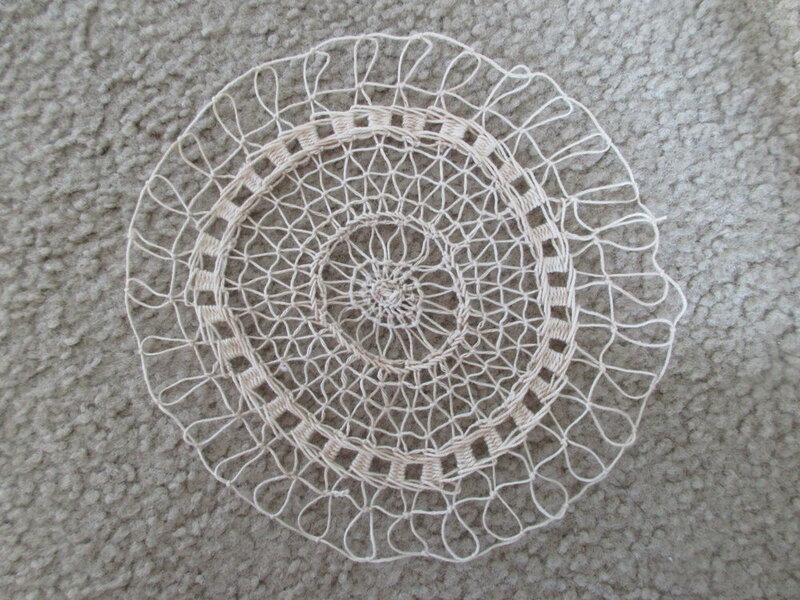 The completed Tenerife lace. I used a standard sized crochet cotton that I had tea dyed a couple of years ago. The color change from the tea doesn't show up much any more, there are just a few small patches that are more brown than the rest. The thin cotton gives the finished piece more "body" than I'd anticipated. I'd expected it to be extremely floppy and it's only about half-floppy. Whether or not I starch it will depend on what I decide its final use is. If I use it in a beach-cover or other garment it won't need starched at all. I liked the idea from the video of only putting in half of the spokes to start with so that the center isn't too dense to work easily. Adding spokes when the space between gets to wide for tidy work makes the darning stitches more effective as well as giving wider design scope. I'm quite happy to have found another possible use for the knitting looms since I really do prefer to do my knitting on needles. The plan for this bag came from another of Crone-Findlay's videos. I only watched it once and that led me to make a couple mistakes in construction that meant one of the possible pockets had to be on the outside or else closed all together. Making a wider crochet border that starts a little above the bottom corner was my answer to try to secure any items that would be in that pocket. Over all I'm not dis-satisfied with the final item, but there are definite changes I would make to bring any subsequent items more into line with the one from the video. If I were to line the bag I might *need* to put the pockets on the outsides, so I'm not sure if I would line it.